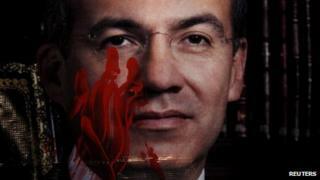 On the final day before President Felipe Calderon leaves office, Mexicans are looking back at his presidency. The president's supporters point to a series of positive economic achievements as evidence that his time in office has been a success. The economy is stable, in decent health, even, at the height of a global recession. Senator Ernesto Cordero of Mr Calderon's PAN party says the government generated $126bn (£78bn) of direct foreign investment in Mexico over the past six years and created some 2.5 million new jobs. The government is also proud of its record on health, pointing to the creation of hundreds of new hospitals and clinics - the president recently referred to his time in office as "the presidency of health". However, Mr Calderon's tenure has been marked by drug-related violence that has seen an estimated 60,000 people killed in six years. The president says he had little choice but to launch the military-led campaign against the drug cartels given the levels of violence he faced when he came to power, and for most of his presidency, polls suggested a majority of Mexicans supported his approach. One of the president's main supporters, Senator Ernesto Cordero, points out that 25 of the 37 most wanted criminals in the country have been captured or killed during his presidency. And certainly the Zetas gang is much reduced as a force in the face of a series of high-level arrests and killings by the authorities, particularly the marines. However, other polls suggest that they also thought the cartels were winning the war. The Calderon administration undoubtedly faced a range of complicated issues when it came to office, not least widespread corruption. But when voters judged it on its handling of such matters, the party performed poorly at the polls in July. The BBC has compiled six episodes that have marked Mr Calderon's six years in power, the impact of which may still be felt during the presidency of his successor, Enrique Pena Nieto. A huge fire started by gunmen at the Casino Royale in the city of Monterrey in August 2011 was one of the most brazen attacks of Mexico's drugs war. A group of men entered a packed casino in broad daylight before dousing it in petrol and setting it on fire. Terrified customers were trapped inside and 52 people were killed in flames amid the ensuing panic. The attack, which was caught on CCTV, profoundly shocked Mexico. The government reacted by immediately arresting several members of the feared criminal network, Los Zetas. The men later said the attack was intended as a warning to the casino owners over their failure to pay the gang extortion money which had "gotten out of hand". The gunmen started the blaze with the clear intention of spreading panic. But what might have been intended as a fright quickly became a tragedy through a combination of factors: there were very few emergency exits inside the casino and several of the main escape routes had been locked. "What happened at the Casino Royale was a mixture of stupidity, bad luck and criminals wanting to show they were more criminal than the others," says former Attorney General for Organised Crime in Mexico, Samuel Gonzalez Ruiz. At the time, President Calderon described the attack as "an abhorrent act of terror" and called the gunmen "true terrorists". His use of the term "terrorism" was controversial and seen by some as making political capital out of a tragedy. "What happened in Monterrey has nothing to do with ideology," said Jose Narro, dean of Mexico's National Autonomous University (Unam) at the time. "They are simply profoundly criminal acts." In September 2010, Mexico celebrated 200 years of its independence from Spain. At the heart of the bicentennial celebrations was to be a new monument, the Estela de Luz, an enormous tower of 1,704 quartz panels lit up by LEDs. However, it was only unveiled earlier this year - more than 15 months late, and costing twice the original budget. Part of the reason for the spiralling cost was the failure of the construction firm to calculate the correct dimensions of the foundations. Esthela Damian, a politician who was part of a congressional investigation into corruption at the time, says a failure to correctly estimate the costs was exacerbated by endemic corruption. "The legal system of responsibilities for public servants isn't sufficiently energetic nor does it prohibit acts of corruption in Mexico," she says. Many people found the Estela de Luz ugly and uninspiring. At the time of its inauguration, columnist Andres de Luna called it "a work of ostentatious ugliness" and "a monument to corruption". During an interview this year, Mr Calderon admitted corruption had occurred in the building of the Estela de Luz, but said the government employees involved were being prosecuted. Unfortunately, the Estela de Luz wasn't the only failed project during the bicentenary, says John Ackerman of the National Autonomous University in Mexico City. "There was a giant papier-mache figure erected in the Zocalo [plaza in Mexico City] that cost millions of pesos. It was thrown out and ended up in a parking lot of a federal government building," he says. President Calderon says that in time the Estela de Luz will become an icon in Mexico City. In an interview on national television, he compared the monument with other key landmarks in the capital that had suffered initial problems before being accepted by the public. In August this year, an armoured car with diplomatic licence plates carrying two CIA agents and a member of the Mexican marines was travelling along a road between Mexico City and the resort town of Cuernavaca. The car was ambushed outside the small town of Tres Marias by about 15 gunmen armed with AK47s, who fired at the vehicle. When uniformed members of the Federal Police arrived, they joined the gunmen in attacking the diplomatic car. The two CIA agents and the Mexican marine were injured but survived the prolonged assault. The government immediately ordered an investigation. Currently, 14 federal officers and a number of their superiors are facing attempted murder charges over the attack. The episode highlighted the depth of the conflict between the different security agencies, says Ana Maria Salazar, a drug enforcement official under US President Bill Clinton. "To me it's all linked to a lack of clear leadership. The president didn't surround himself with the right people and he didn't get his institutions under control," she says. It should have been a moment to savour for the Calderon administration. In October, the marines killed the second most powerful drug lord, Heriberto Lazcano, or El Lazca, the leader of Los Zetas. Instead, it descended into farce. Unaware of the identity of the man they had shot, the marines handed the bullet-riddled body over to a local funeral parlour. Later that night, a group of armed men, believed to be Zetas men loyal to Lazcano, came to the funeral home and took the body away. After several hours of confusion, the authorities had to admit that although they had killed the leader of Los Zetas, they had subsequently lost his body. The marines produced some photographs of a blood-soaked body and the Interior Ministry gave assurances that the man shot was, without question, Heriberto Lazcano. But many Mexicans remain unconvinced. Lazcano's death was a series of errors involving orders from above, says security expert Samuel Gonzalez Ruiz. "The point about El Lazca is that the marines didn't know who they'd killed. The story was later sold as a kind of planned operation. But it wasn't." What should have been one of the sweetest victories for Mr Calderon in the war on the drug cartels instead was ridiculed in the media, and underlined for many the continuing power of the drug gangs in northern states like Coahuila. If the fire in Monterrey was shocking for Mexicans, it cannot compare with the outrage and deep sadness felt over the deaths of 49 babies and young children when a fire tore through the ABC day-care centre in Hermosillo, in the state of Sonora, in June 2009. If there isn't justice for 49 innocent children what hope can there be for the rest of us? The blaze began in an adjacent warehouse after cooling system malfunctioned. It spread along laminated ceiling tiles until a rain of fire fell on 142 babies and toddlers during their afternoon siesta. "It was definitely the darkest day of the last six years in Mexico," says Julio Cesar Marquez, whose two-year-old son, Yeye, perished in the blaze. The tragedy was caused by a catalogue of human error and institutional negligence. ABC was run by the federal government but leased out to a private company. It was housed in a converted warehouse, deemed acceptable by safety inspectors just two weeks earlier. Yet there was no sprinkler system and fire alarms were absent or faulty. There was just one working exit, the front door. The children were looked after by a skeleton staff who apparently lacked proper fire training. Desperate onlookers tried to smash holes into the walls with their pick-up trucks to free those trapped inside. President Calderon promised an exhaustive investigation saying no stone would be left unturned, no matter how high the blame went. However, the victims' families say little has happened since. Three-and-a-half years later, out of 27 people who faced charges, including the state fire inspectors who declared the nursery as safe, only 2 low-level functionaries have been jailed. For grieving father Julio Cesar Marquez nothing less than the integrity of Mexican justice is at stake: "If there isn't justice for 49 innocent children what hope can there be for the rest of us?" There was barely a month to go before the presidential election earlier this year when, early on a Sunday morning, 49 mutilated bodies were discovered piled up on the outskirts of the northern city of Monterrey. The victims had been tortured and the bodies were missing hands, feet and heads. None of the victims has ever been conclusively identified. Suspicion fell on Los Zetas and the attack is believed to have been part of a long-running feud with their rivals, the Gulf Cartel. Ultimately the authorities laid the responsibility at the door of Miguel Angel Trevino, an extremely violent Zeta leader known as Z-40. However, while the victims were not connected with organised crime, killing them was a statement to Mexican society about the control of public space, says John Ackerman. "It was intended to clearly show who was winning this conflict," he says. This gruesome episode is reminiscent of a number of other attacks, such as the San Fernando massacre in Tamaulipas in 2010 in which 72 people were slaughtered - or the discovery of some 200 people in shallow graves in the same area the following year. Nonetheless, the government says that its military strategy has been reaping results over the past six years, as many previously-violent parts of the country, such as Ciudad Juarez and Tijuana, are now under control. And, they argue, the murder rate in Mexico is slowing.